The five articles introduced are so weak that it’s hard to see this charade as anything other than an attempt to interfere with Mueller's probe. If a majority of the House voted to impeach such an officer, and after a trial, two-thirds of the Senate voted against him as well, he would be removed and disqualified from holding any future “office of honor, trust or profit under the United States.” Impeachment is never an action to be taken lightly, but successful impeachment in this case would have outsized consequences for the Department of Justice and perhaps President Donald Trump himself. Because of Attorney General Jeff Sessions’s recusal, Rosenstein’s removal would mean that Solicitor General Noel Francisco would become Acting Attorney General for purposes of supervising special counsel Robert Mueller’s investigation into Russian interference in the 2016 election. Impeachment is never an action to be taken lightly, but successful impeachment in this case would have outsized consequences for the Department of Justice and perhaps Trump himself. Although impeachment of executive branch officers is perfectly consistent with the Constitution’s text, it is also incredibly rare. In its 229-year history, the House of Representatives has only impeached one such official — Secretary of War William W. Belknap. Belknap was impeached by the House in 1876 for allegedly taking bribes in exchange for government contracts (he was ultimately acquitted by the Senate, albeit not before he had resigned). Rosenstein is not going to be the second. The five articles introduced on July 25 are so weak on their face that it’s hard to see this enterprise as anything other than a thinly veiled attempt by Trump’s staunchest supporters in Congress to further interfere with the ongoing investigation into Russian meddling in the 2016 election. If the president really wants Rosenstein out, he can — and should — just fire him. Consider the specific “high crimes and misdemeanors” Rosenstein is charged with having committed: Article I accuses Rosenstein of failing to recuse himself from an investigation that does not exist — the special counsel investigation into the Hillary Clinton campaign that Rosenstein’s boss, Attorney General Jeff Sessions, has declined to authorize. Article II and IV of the resolution accuse him of not fully complying with congressional requests for sensitive law enforcement information — actions on his part that were not only fully consistent with decades of Justice Department policy, but that could easily be countermanded by the White House if Trump actually wanted the DOJ to fully cooperate with congressional investigators. Article III is even sillier: It accuses Rosenstein of supervising “unnecessary redactions” from various documents produced in response to congressional requests — even though, as the resolution concedes, “[t]he Department of Justice acknowledged the unnecessary redactions and agreed that some information should not have been redacted.” But the capper is Article V, which principally accuses Rosenstein of failing to properly vet the application for a FISA warrant against Carter Page. The Page application isn’t actually legally deficient. But even if it was, the application was filed in the FISA Court in October 2016. 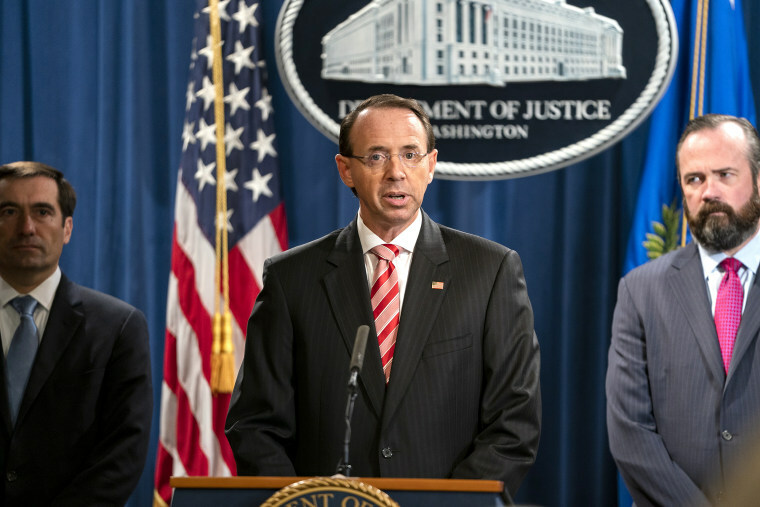 Rosenstein did not become Deputy Attorney General until April 2017. Even the impeachment resolution’s supporters seem to understand how frivolous its claims are. Rather than filing the document as a “privileged resolution,” which would have forced a vote by the full House of Representatives (and put House Republicans in the position of having to vote in favor of or against Rosenstein), it was filed as an ordinary resolution, which can — and likely will — be quietly buried in committee. The emptiness of the claims against Rosenstein helps to explain why there have been so few impeachments of executive branch officers throughout Congress’s history. The emptiness of the claims against Rosenstein helps to explain why there have been so few impeachments of executive branch officers throughout Congress’s history. Because of the president’s control over such officials, he invariably has the power to order them to take particular actions (including, as especially relevant in Rosenstein’s case, to fully comply with congressional document requests), and fire them if they refuse to do so. To similar effect, executive branch officers who have truly engaged in misconduct don’t usually hang around long enough to be impeached; they either resign in disgrace or are fired by their superiors. The only scenario in which an executive branch officer would still need to be impeached is when the president either expressly approves, or at least implicitly sanctions, the misconduct at issue, and Congress disagrees. In those circumstances, Congress usually, and rightly, directs its ire not at the lower-level bureaucrat, but at the president himself. As the Rosenstein impeachment resolution underscores, these are unusual times. By going after Rosenstein instead of Trump, the impeachment resolution all-but telegraphs that its goal is not to actually force the production of the contested documents, or the appointment of a second special counsel, but simply to provide a pretext for removing an executive branch officer who serves at the pleasure of the president. And the only reason to do that is to protect the president — who already has the unquestioned power to fire that officer — from provoking the political blowback such a step would necessarily engender. In other words, the Rosenstein impeachment charade is a transparent effort to do the president’s dirty work for him, either by removing Rosenstein directly, or by providing enough of a fig leaf for the president to fire him for cause. While such a move is clearly within Congress’s constitutional authority, it is not only beneath its dignity, but it is an outright subversion of the independent institutional role it is supposed to play as a coordinate branch of government within our constitutional system.